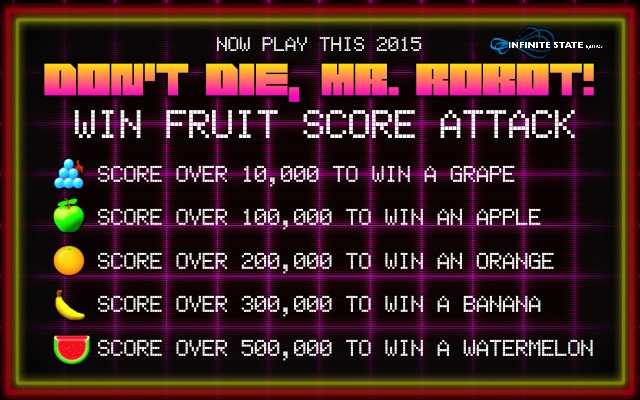 DDMR at Now Play This: WIN SOME FRUIT! 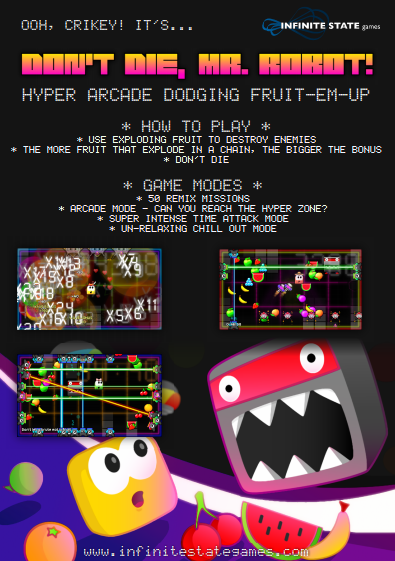 The cult hyper dodging fruit-em-up Don’t Die, Mr. Robot! is going to be on display at the Now Play This exhibition this weekend in Somerset House, London. We’re going to be showing Arcade Mode with a special prize: YOU CAN WIN SOME REAL FRUITS! Now Play This (http://nowplaythis.net/) is a new event about games and play, taking place in the New Wing at Somerset House in London, 4-6 September 2015. Over the weekend it’ll be home to dozens of games and playful activities of all descriptions. On Saturday 5th from 10am to 2pm, our game Don’t Die, Mr. Robot! will be on one of the rotating screens for you to play. And we’re gonna have some fun because everyone can play to win… WIN SOME FRUIT, THAT IS! That’s right! We’ve set some points targets for you to try and beat. Do a good job and you could be taking home a lovely bit of fruit bought that morning from New Covent Garden fruit market! Grapes. Giver of wine, raisins and that weird purple stuff called grape juice but totally can’t be legit. The grape is a humble but delightful chap, always able to refresh and entertain. Since the garden of eden, the Apple has been in hot demand due to its pleasing colour and how fun they are to steal. Regarded by many as the most transportable of fruits, a special nod must be given to the Apple for its ability to cry tears of cider when it is sad. Oranges, like blueberries and purplefucks, are named after what colour they are. They were invented in 1867 by King Henry VIII to refresh schoolboys playing football. The international symbol of welcoming, with its spiky exterior and furious leaves, the pineapple is a strange but sweet fruit. It is not advised to look at one too long if you’ve eaten too many mushrooms. There’s a whole other world in there. There’s no way anyone’s going to score over 500,000, mate. Only three people in the world have ever done that. But watermelons look so cool we’re sure just being in the presence of one will be enough to spur someone to reach this lofty score. No doubt after all that fruit chat you’re bursting to come down and play our game and visit all the other exhibitors at Now Play This. Well, you’ll need tickets first, but it’s cool they’re pretty cheap. Have a look on the Somerset House website here! DISCLAIMER: We might run out of fruit / forget to buy the fruit / not be allowed to give away fruit. BYE! Next postFrutorious HD is OUT NOW!